Mood swings and irritability are particularly unsettling symptoms of menopause that affect as many as 50% of American women during this time of their lives. They can cause emotional upheaval and have a significant impact on a woman's life and particularly her personal relationships. As they can be difficult to diagnose, many women suffer needlessly and are unaware of the numerous solutions and treatments available that can help relive these unfortunate menopausal side effects. Mood swings and irritability during menopause are caused by fluctuating levels of hormones that in turn cause serotonin - the chemical in the brain that determines emotion - to rise and fall. These swift changes in serotonin levels have a big impact on a woman's state of mind and emotions, often leading to rapid changes in mood, increased irritability, or irrationality. In many cases, women experience reactions or feelings out of proportion to the circumstances that trigger them. This is one of the more difficult, but most definitive, aspects of distinguishing mood swings related to menopause and not just a normal shift in feelings caused by external stimuli. The intensity of the moods and level of irritability are another factor that distinguishes the menopausal nature of these feelings, as they are generally more intense and prolonged. 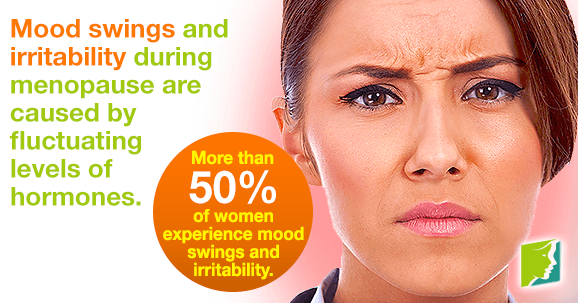 Mood swings and irritability can, unfortunately, have a detrimental effect on a woman's life and her relationships. Fortunately, there are plenty of options for women who want to regain control of their emotions. Treatments include psychological, physical, and pharmaceutical approaches. Also, there are several different types of medication that may have an impact on stronger or more chronic cases of mood swings and irritability. For those not wishing to use synthetic hormones or if these medications are incompatible with particular patient needs, there are several natural herbal remedies, which some women prefer to use. Please read more about mood swings. Amin, Zenab, Turhan Canli, and C. Neill Epperson. (2005). Effects of Estrogen-Serotonin Interactions on Mood and Cognition. Behav Cogn Neurosci Rev, 4, 43. Love, Susan, and Karen Lindsey. Dr. Susan Love's Menopause and Hormone Book. New York: Three Rivers Press, 2003. This article explores the ways to distinguish mood swings and bipolar disorder from each other.